If you have cats you need to know how to keep them happy - here are some lighthearted "do's" and "don'ts". I call this a "recipe" for a happy cat, but there's really no "one size fits all" in this case! What makes one cat happy may be the worst thing for another. I have had several cats and I can say they have been very different in their likes and dislikes. But there are some general rules for making a cat happy, both "Dos" and "Don'ts." This is a lighthearted look at cats and how to make them happy. So hope you enjoy, and maybe you'll even find something that can help you learn how to make your cat happy. So maybe you have a cat, or a kitten, and you think how cute, what fun we're going to have, this is a great pet. 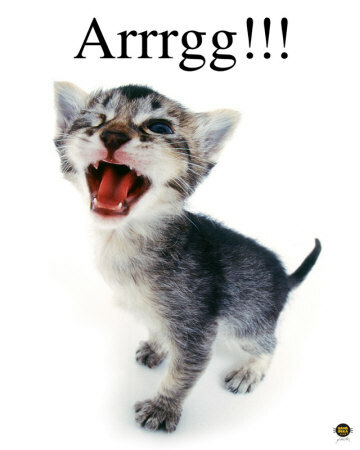 Now, to make your cat happy you need a little attitude adjustment! This is a happy cat! First rule of making a cat happy is to realize that they see you as a servant, a slave even, whose purpose in life is to serve them and make them happy. The greatest failures to make a cat happy come from misunderstanding this point. In the office of the veterinarian that we visit, somewhat frequently, with our cats there's a sign that says "Dogs think they're human, cats think they're God." 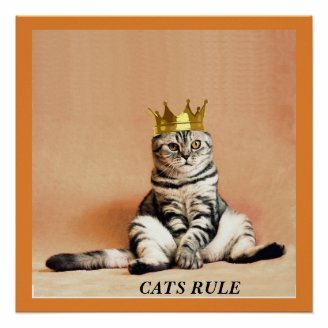 True, except that most cats know they're royal if not actually divine! 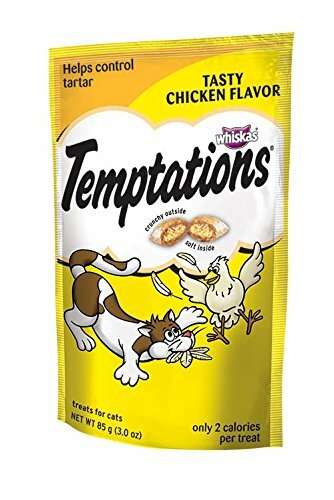 Second rule of making a cat happy is to reward them for good behavior. This is not because it will train them to behave better or make them feel good, like it will with a dog, it's because your cat expects, demands even, a reward for what he or she considers good behavior. Note, the cat decides what is good behavior! This often takes the form of bringing a special "offering" in the morning, hopefully to the front doorstep and not inside. The best response involves at least two people, one to praise the cat warmly and eloquently and serve a favorite treat while the other person disposes of the (hopefully dead) mouse/bird/frog/mole or whatever appropriately. When the offering is brought inside this is even more important. And when the offering is brought inside and is still alive, several people may be required to chase it around the house and hopefully recapture it while one person diverts the cat with his or her well-deserved reward. Third rule of making a cat happy is to provide comfort. This "comfort" takes many forms and varies from cat to cat, as you will see with my cats. 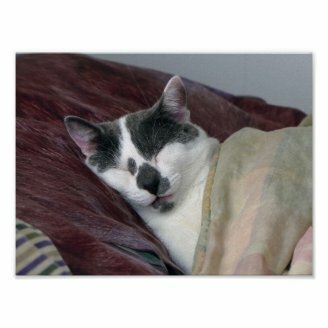 However, the bottom line is that your cat will assume that every warm, soft spot in your house is intended as a place for them to sleep. This can translate into sleeping on your bed, your couch, your lap (if you are so honored), the laundry basket (after the clothes are washed of course! ), and a bunch of places you'd never have imagined. I love this book. Sometimes I just take it out and look through the pictures, and smile! 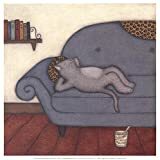 Some of the pictures here remind me so much of my own cats when they're happy! It's just a delightful book for lovers of happy cats. First Rule in the don't list of having a happy cat is don't ever give your cat a bath! 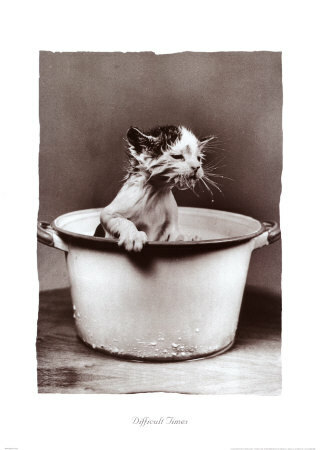 Cats not only resemble drowned rats when wet, they take great offense at looking like drowned rats. In their horror at the close encounter with water, whatever the temperature, they also scratch, claw, bite, and otherwise draw blood from any hand that gets close enough. And since you have to hold them down to get them wet, the water gets pretty bloody (voice of experience!). Now this isn't to say that cats aren't interested in water and bath tubs. They will happily climb in and try to drink any water left by the drain, or dripping from the faucet. My cats will actually ask for the faucet to be turned on so they can drink the water! Second Rule is don't ever give your cat a pill! You have at best one chance to not only get a pill in your cat's mouth but also to get them to swallow it. Mostly if you do get it inside those jaws bordered with sharp fangs that make up the hissing and spitting mouth, the pill usually gets spat out immediately after you let go of the cat. If you persist, you soon wonder whether there is much medicinal value left in the soggy and dirtied thing that you've retrieved yet again from the floor, or whether greater harm will be done by forcing such an unclean thing down their throat. And of course the whole procedure is destroying any success you were having in making your cat happy! Third Rule is don't ever take your cat to the vet! You see, putting your cat in a cage or box of any sort freaks them out. Then the car ride is much worse. If you can endure the wails that come from the container long enough to reach the vet's office your cat will have shed half its coat, be shaking violently, and generally look to be on death's door. And all you wanted was to get a shot to prevent some nasty disease! Fourth Rule is don't ever close a door in your house! If you do close a door your cat will immediately begin to bang on it, scratch at it, and generally disturb you until you open the door. Then, of course, they merely walk around and back out to where they came from. Take special care with a door that is normally closed, though, such as a closet door, and be sure to return and open it a few minutes after you re-closed it - to release the cat trapped inside. Same goes for basement doors. Fifth Rule is don't ever practice music with your cat in the room! In our house we have players of flute, trumpet, saxophone, and trombone. If a cat is unfortunate enough to be trapped in the same room as someone who begins playing one of these instruments they immediately join in with wails that increase in volume until someone rescues them. Sixth Rule is don't ever laugh at your cat! Cats are very sensitive creatures. Laughing at them hurts their feelings. Cats are proud animals, and rightly so! If you want a happy cat make sure you keep your laughter hidden from them. 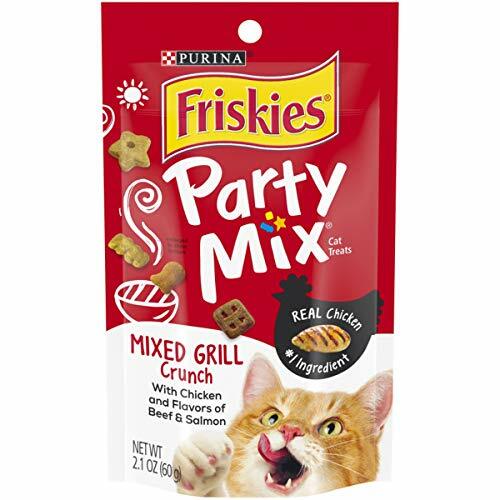 Even if you did a "don't" you might have a happy cat if you have the right treats on hand! Our little cat "Leo" is the cutest cat, soft and friendly. Until you try to take something from her or give her a pill - then she comes out with the scariest deep throated growls! Little Leo loves to play, and hides in the most unlikely places. She's the only one who likes our basement, and she'll stay down there for hours, especially if we forget about her! Leo would be happy to be an indoor cat really, she loves her litter box in the winter - never sets paw on the snow unless my daughter throws her in it! Doesn't go out in the rain either. But she does like to lie out in the sun while we have tea at our picnic table when it's nice weather! Leo remains the funniest kitten despite her advancing years. She loves to hang on the back of my chair, like a panther on a branch of a tree. This one really lived up to her royal name "Princess." In every way she knew she was superior to all others, that included her human slaves and the other creatures not really worthy to live in the same house as her (namely our other cats). Sadly we lost her to heart disease after 16 precious years. To make the Princess happy required perfect behavior, attending exactly to her needs without any error. The slightest mistake was treated with the greatest disdain, and sometimes a swat of the royal paw. Don't touch this royal creature without an invitation! She was very fussy about what she would eat - loved salmon but not too many other kinds of fish, wanted special treats served in her special bowl, and breakfast in bed! Our Princess was a creature of true comfort. She always found the best spot in the house and claimed it, complaining loudly if anyone tried to take it from her! Seems like he remembered his days of being "homeless" and often chose to sleep in a cardboard box. As you can see from this picture, he also liked to keep a supply of his favorite food, tuna, close by. 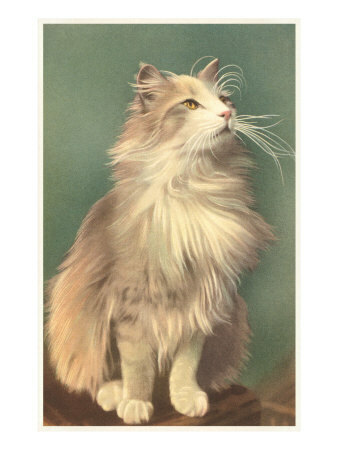 Not really a cat who went for comfort, "Mister" tended to focus on safety and the ability to escape quickly. He was well known for rushing out the back door whenever anyone approached our driveway. Of course, the back door brought him right beside any large vehicle he was trying to escape from! One of the most important things for this "guard cat" was to allow him free access to the outside. If he was sick or injured and supposed to stay inside for a while he went crazy, just had to be able to go back outside into danger. He'd even hide in a bush during a thunderstorm rather than stay indoors. When "Mister" cat was truly happy he would sleep on his back, paws in the air. Usually he did this on the couch, or our bed. He was known to do it in the middle of our yard though, lying on his back in the grass and watching butterflies flit around overhead. Bliss! Pippin is the latest member of our family. He found himself a home with our daughter when his owner was living in an apartment that didn't take pets. She ended up moving to Florida, without him! So Pippin stayed. When my daughter couldn't keep him in her apartment, he came to live with us. We soon learned that he was a silly "adventure" cat who lives for fun! He loves to go outside, hunting and playing with other creatures. Tired out after his adventures, Pippin is good at getting comfortable! Quite the sweetheart when he's sleeping happily. 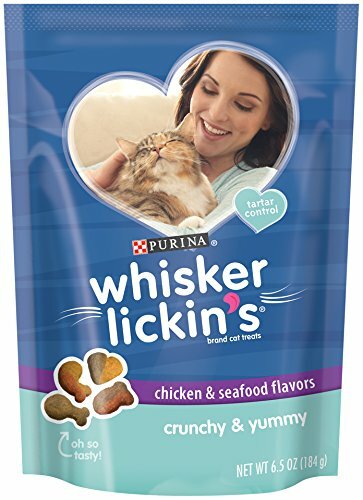 So What Makes Your Cat Happy? Haha - you've got it! So, the cat is always in charge. And there is nothing you can ever do to gain power. I love that your Walker cat rushes back inside when something happens! 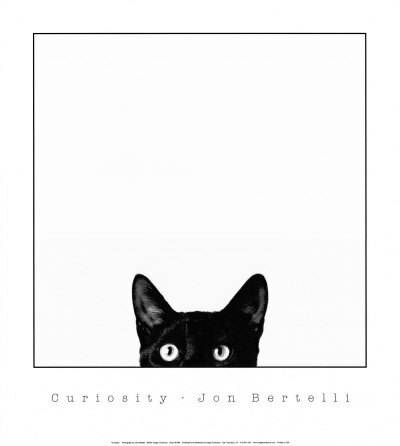 A fun read that any cat love can readily relate to. Oh, that think about closing doors hit home. Our Walker simply won't tolerate that at all! Even on his supervised outdoor playtime, we have to leave the door to the house open so he can rush back in if the slightest thing goes awry. 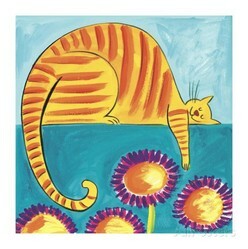 Colorful cats and fantastic flutes. The art of Rosina Wachtmeister is bright and exciting, filled with fun images, and focuses on two of my favorite topics - cats and music. A delightful book in the Helen Exley little gift book series, "Time for Tea" contains quotes about the joy of tea and tea drinking. It's the perfect gift for tea lovers!